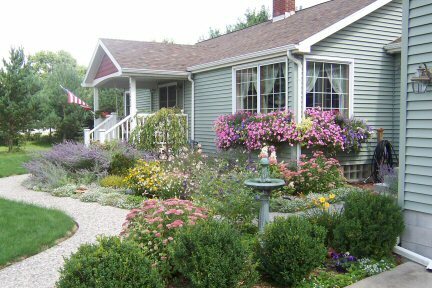 The yard of this Victorian style home offers an extensive collection of perennial plantings that adds blooming colors through out the front yard and in full view of the public. The plantings add character to the streetscape of the historic homes that are common along Fifth Street. Interesting ornamentation compliments the yard and adds to the quality of the yard display. 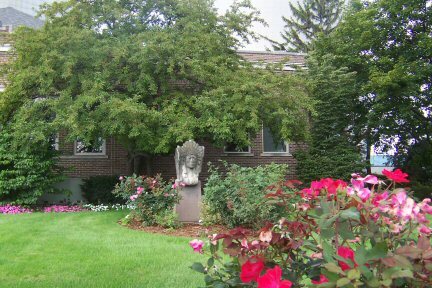 The Kantzler Arboretum, part of the Veterans Memorial Park and the Riverwalk, was conceived by the Bay City Garden Club and was constructed in the early 1980’s on the site of the former Davidson shipyard. 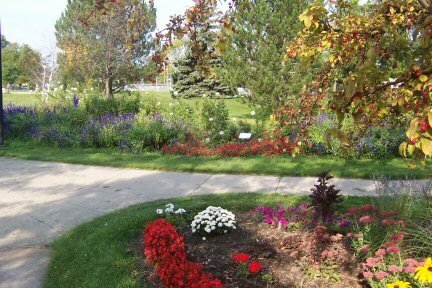 The arboretum includes several planting bed areas, several of which are maintained by Dr. Burk and the staff of Bay Eye Care. The brilliant array of colors adjacent to the sidewalk encourage strolling in this public space. Dr. Burk and staff have dedicated consider time to adopt and coordinate the adoption of the flower beds in this parkland. Located at the western end of the Center Avenue Heritage Route, this site is an example of how a small amount of landscape treatment can compliment any business site. 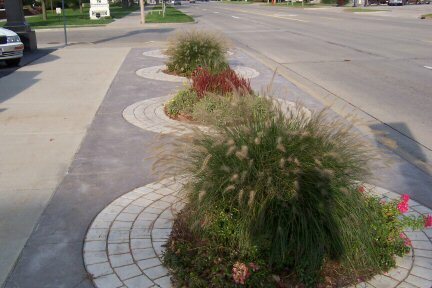 The use of decorative stamped color concrete creates four 4 circular planting areas planted with perennial grasses. 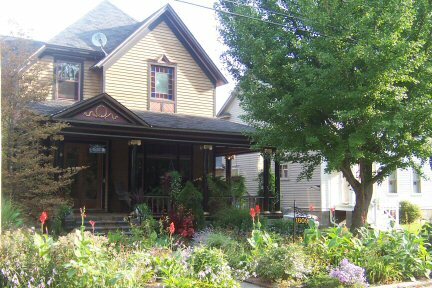 The plantings are eye-catching and compliment other plantings on this historic district. First impression as you pull in the yard... A treasure box-- filled to overflowing with colorful jewels! Petunias and other annuals spill from window boxes and pots. Flower beds of mixed perennials can’t be contained, and everywhere there is fragrance, butterflies and birds. Don and Peggy have lived on this 2 acre lot for 19 years. Peggy has a cutting garden out back and has fresh flowers throughout the house. Don has a large vegetable garden and starts his tomatoes from seed in the basement every year. He does all the canning, and they both still work full time jobs. They created a private patio out back by filling in an in ground pool. I counted at least 3 seating areas all furnished with Yard Sale treasurers, another of their many hobbies. 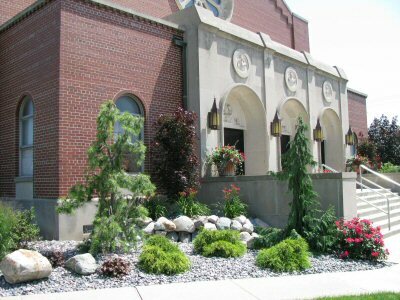 Now that the construction of the Parish Center is complete and the landscaping ties the buildings into a cohesive unit, things are definitely looking greener on the 3 block parish grounds. During construction color was limited to large pots at the entrances. The one at the main entrance has to be 5 ft. tall and 10 ft in circumference. Their secret fertilizer?? Miracle Grow, of course. 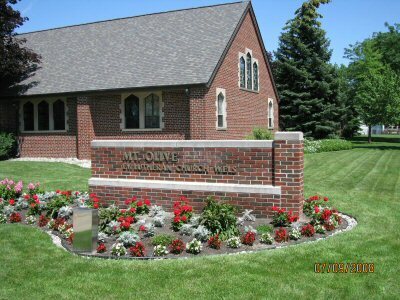 Since spring, parishioners made Memorial Contributions to a landscaping fund. Jan Dzurka, Master Gardener, and tireless volunteer, selected perennials, using them first inside the church and then transplanting them outdoors as new beds were laid out. Bob Hatfield, grounds keeper, provides extra muscle when needed, but Jan is there 2 or 3 evenings a week. Probably the worst sight in town for a Garden !! Monitor Sugar has managed to carve out a small oasis of a garden around their offices at 2600 S. Euclid. Originally laid out by Begicks, and now maintained by Turk’s Lawn service, the patch of color makes you do a double-take when you see it for the first time. Evergreens, perennial grasses, and Knockout roses surround a “Big Chief” statuary that speaks to the history of the company. Two thumbs up and a big pat on the back for even making the effort! This yard is an oasis in an established neighborhood. Perennials line the front yard and hanging baskets adorn the porch. Colorful coral bell plants add to this shade garden. Host as, grasses and other plants on the extension extend the welcoming front yard. 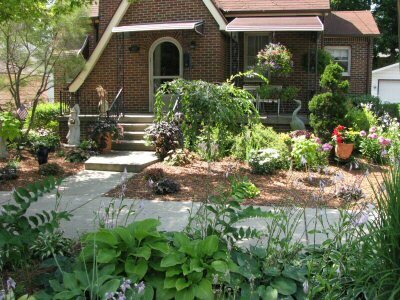 This is a beautiful example of a no lawn front yard. 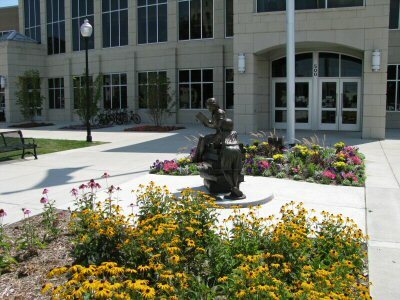 The library has an inviting floral front entrance with flowers surrounding the bronze sculpture of a Reading Girl. Lawns on either side of the entrance provide a place for children to play, and park benches allow others to rest in a pristine setting on Center Avenue. Trees add to a park like setting. Flowers surround the parking lot. A real treasure for Bay City. This church is a haven in the mist of our city. 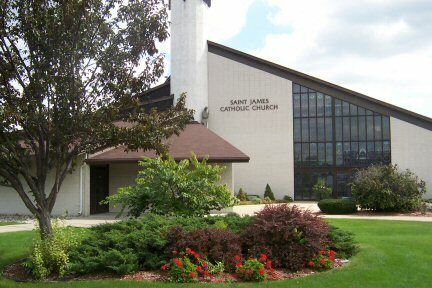 The church name is set in a planter of geraniums and ornamental cabbages. Roses and planters adorn the front entrance. 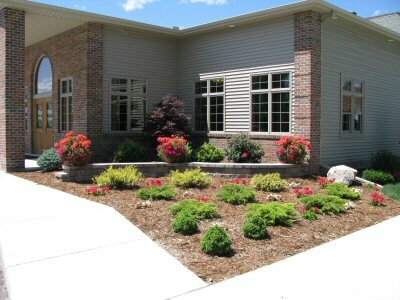 Boulders, trees, shrubs, flowers, assorted weeping conifers, and other evergreens make this a year round landscape. It's eye catching with the color and plant combinations. It is perfect, well maintained inviting; Pleasing to the eye. Burnt orange and Salmon bring out the landscape in Impatiens and Geraniums, along with a few Roses. Other Highlights include a waterfall at the side of the drive. Across the yard, red bud trees on a berm with impatiens and white begonias for accent. Attractive combination of red, white then dusty miller. The rock boarder is unique. Different in layout and well liked. Members of MOMS (Mary and Martha Society) formed a committee and planted the area, removing tired old bushes to add a punch of color at the corner of Sidney and State St.
Members sign up to weed and water each week. Its not one little garden, its all around and gorgeous. There is curb appeal and its eye catching. A waterfall at the entrance and A variety of colors interspersed with Green, add a soothing affect for those in grief. The waterfall at the entrance was done by Roger's Nursery. Mary Heinlein laid out the landscape scene.